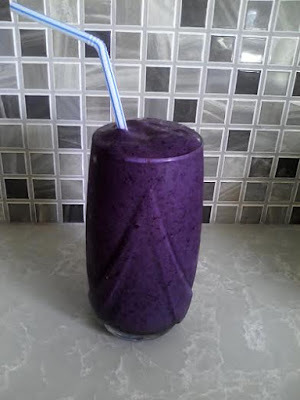 Blueberry Muffin Smoothie - No Way That's Healthy! The other day I bought some beautiful bags of frozen fruit and got super inspired to make a smoothie. My first smoothie came out so good that I decided I will be making a “Smoothie A Day“ Challenge! I will be making a smoothie (almost) every day this month and will be sharing the recipes here and on my Facebook Page. It is a great way to get in some fruits and we may even sneak in some veggies for an added boost of healthiness! Of course every recipe will be super delicious and I encourage you to share pictures of the smoothie you make! Blend till smooth and Enjoy! This recipe makes a lot so feel free to use less ingredient’s if only making it for yourself. My husband, kids, and babysitter loved this one! How did you get that so purple? Right! It looks like I added coloring, but nope- the blueberries make it so beautiful! Looks and sounds delicious! BTW…LOVE your counter top and back splash! Hurray for smoothie month! Cant wait to try!